Chesler Park is a classic hiking or backpacking trip located in The Needles District of Canyonlands National Park. It’s relatively short, not terribly difficult, very scenic and provides a multitude of route options to choose from. The only downside to backpacking in Chesler Park is the lack of water sources, so if it’s hot out, it might be better as a day hike or plan to fill up at one of more distant water sources in the area. The hike to Chesler Park begins at the Elephant Hill Trailhead (38.141809,-109.827227) located about 6 miles west of the Canyonlands Needles District Visitor Center (Driving directions to Elephant Hill Trailhead). The last 2.7 miles of the road is gravel, but is passable to passenger cars in dry conditions. Beyond the Elephant Hill Trailhead, the road becomes an extremely difficult 4WD road. Check in at the Visitor Center when you enter the Canyonlands National Park for current conditions. While there are no fees to park at the Trailhead, you must pay a $15 fee to enter Canyonlands National Park unless you have an annual pass. The trail starts by climbing up out of the valley through some interesting joints with stone stairs laid in them. It is clear that the trail receives a considerable amount of traffic, especially the first mile or so. There are a multitude of other trails branching off here and there, so make sure you carry a map and pay close attention to the signs at each junction. The park service generally does a good job at keeping the signs and cairns maintained, but you should be ready to navigate on your own if necessary. About 1.5 miles into the hike, the trail begins the descent into Elephant Canyon, the last and biggest obstacle standing between you and Chesler Park. Luckily, it’s a very scenic obstacle as the trail passes through slot canyon-like joints in the rock. If it’s hot out, these offer a nice break from the sun. At the bottom of Elephant Canyon, keep an eye out for signage leading you out the other side of the wash and towards Chesler Park. Approximately 2.7 miles from the trailhead, the trail crests into the northeast corner of Chesler Park. The trail comes to a junction shortly after entering Chesler Park, one way leads toward Devil’s Kitchen, the other leads further into Chesler Park. If you are heading to one of the backcountry campsites, they are all located by taking the trail south into Chesler Park. The Chesler Park Loop is one of the best ways you could spend your time in the area. The actual loop portion of the hike begins and ends at the first junction you arrive at when entering Chesler Park from the Elephant Hill Trailhead. The mileage for the loop section is approximately 6.4 miles, so in addition to the 5.3 mile round trip hike to get into Chesler Park, the total hike length is about 11.5 miles. It is recommended to do the loop clockwise, first hiking south into Chesler Park, past all the backcountry campsites and on to The Joint Trail. The Joint Trail is a beautiful section of trail that passes through some joints in the rocks for about 3/4 of a mile. It’s very much like being in a slot canyon but it is actually a joint between two separate rocks, not a typical canyon formed purely through erosion. After leaving the Joint Trail, you pass by the 4WD trailhead for Chesler Park. Walk the road north for a half mile until it meets the main road, then north another half mile or so, watching for the obvious cairned trail leading back towards Chesler Park and Devil’s Kitchen. I believe this junction was signed, but keep your eyes open and you won’t miss it. After leaving the road, the trial winds back up through the rocks and eventually re-enters Chesler Park on the northwest side, eventually meeting back up at the same junction you first came to when entering Chesler Park. View the NPS Needles District Map for details. If the loop is more than you have time for, just heading further south into Chesler Park is worth the time. If you can, head over to the beginning of the Joint Trail on the southwest side and climb the stone steps into the beginning of the long crack. You won’t be disappointed. There are plenty of other loop combinations that can be combined with Chesler Park. I have not completed them, but some obvious options would be to combine Elephant Canyon or any of the other canyons to the east to extend your trip. Permits and backcountry campsite reservations are required for overnight use. You can check availabilty on the Canyonlands Reservation Website but for now, you’ll have to fax or call in your actual permit request. 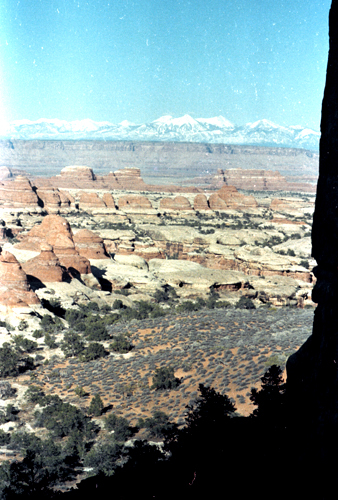 Give the Canyonlands permit office a call before you send your application in. Bruce seems to be the man who usually fields calls and he is very helpful. They can be reached at Mon-Fri from 8am-12:30pm MST at (435) 259-4351 or until 4pm when workload permits. Backpacking permits are $30 per group with a maximum group size of 7 in The Needles district. If you are day hiking, no permits are required but you must still pay the $15 entrance fee to enter Canyonlands National Park.